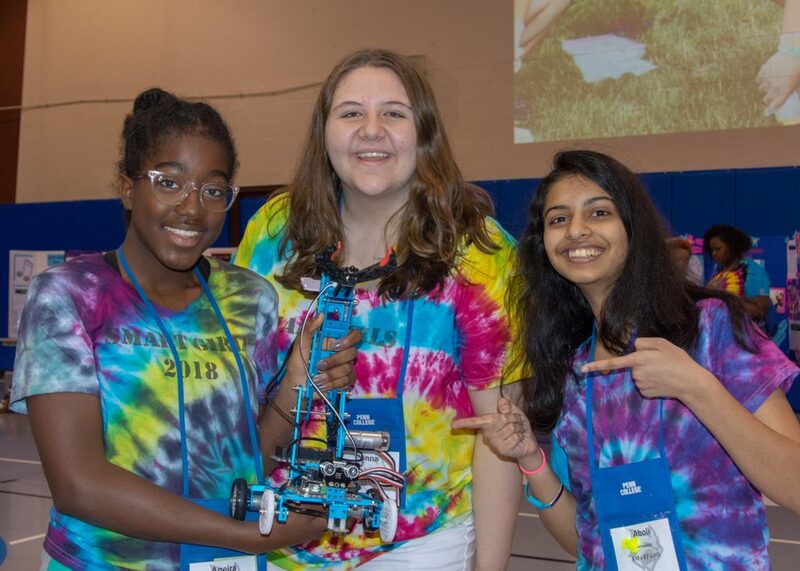 Pennsylvania College of Technology welcomed girls in grades 9 through 11 to their week-long SMART (Science and Math Applications in Real-World Technologies) Girls Camp. The UGI-sponsored camp ran from June 17 to June 22 and attracted local students, as well as students from New York and New Jersey. The girls were divided into teams at the start of camp and spent the week building and programming robots to compete in a variety of challenges. STEM-related topics were taught in the production and fine-tuning of the robots in order to adjust to each new obstacle. The challenges began simple, with robots maneuvering and following a straight line, advancing next to picking up different objects, all ending with the ultimate challenge of a maze where robots had to move into a new space, recognize it, and make turns accordingly. The SMART girls also worked independently to develop professional skills. Each girl was required to write a resume and design business cards. They read, reviewed, and scored themselves using the habits of Steven Covey’s book, 7 Habits of Highly Effective Teens. Additionally, the girls attended and participated in an etiquette dinner where they learned how to network and dine in a professional setting. The camp concluded with a showcase open to families, providing an opportunity for the teams and their robots to show off their STEM skills in action. Presentation boards lined the perimeter of the Penn College gym as each girl shared about the challenges, giving a description of the obstacle and a summary of how the robots performed. Two maze challenges were present, one in the shape of a question mark, the other in the format of a grid, and girls could guide their robots through the mazes to exemplify their hard work. Ending the showcase was an award ceremony where campers were recognized for displaying characteristics of either Leadership, Perseverance, Citizenship or Positivity. As a reward for their exceptional work, each winner was given a robot to take home. SMART Girls camp is recognized as an “innovative educational program” under the Pennsylvania Department of Community and EITC program, through which UGI Utilities made a generous gift.